Sustainable development requires coordinated, comprehensive and sustained Earth observations for early warning, informed policies and effective decision making. In support of this objective the Group on Earth Observation (GEO) is leading a worldwide effort to build a Global Earth Observation System of Systems (GEOSS), providing Earth observations from a multitude of instruments worldwide. It is foreseen that these Earth observation data (in-situ, air and space borne) and derived products are (re) distributed via GEONETCast to a broad range of user communities. Therefore GEONETCast, bringing together the many disparate sources of environmental information, has a significant potential to enhance access to a wide range of information to users. This low cost, global, environmental information delivery system currently operates the European, African, Asian and American services. The data stream transmitted by these communication satellites can be received using a simple and cheap ground reception infrastructure. GEONETCast distributes images that have been used previously mainly by the Meteorological community but which are becoming an important data source to a wide variety of users that deal with environmental analysis. With the ongoing development of GEONETCast, broadcasting (globally) a multitude of satellite observations and associated products in conjunction with cheap ground receiving infrastructure, the data is now at the doorstep of the user community anywhere in the world. Problems related to a limited bandwidth available in many countries are overcome. Efficient processing and analysis routines are required to facilitate incorporation of these environmental data sources and products to improve national and regional policy and (timely) decision making for a better management of the natural resources and face the challenges posed by sustainable development. The low cost ground receiving segment coupled to a freeware toolbox approach is well suited for nonmeteorological organizations dealing with environmental related application domains. 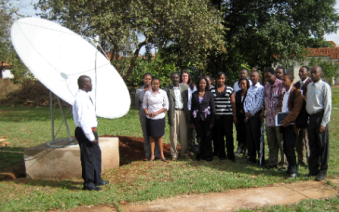 From 6-10 April 2009 at the Regional Center for Mapping of Resources for Development in Nairobi, Kenya, a successful workshop was conducted entitled: “Installation, Configuration of a GEONETCast Ground Receiving Station”. During this week an operational local GEONETCast ground receiving station was established and used for the purpose of the workshop. The data and information received will support the regional centre in its future activities in the region. Hands-on exercises to integrate the data into a GIS and demonstrations showing the versatility of GEONETCast and the IWLIS 3.6 Open Beta Toolbox. Software utilities that are used have been provided to the course participants as well as the necessary contacts to acquire a license, documentation needed to configure a ground receiving station and a set of exercises for further analysis of data and products from GEONETCast. The workshop was jointly organized by staff from RCMRD and the Department of Water Resources, ITC, The Netherlands.